Quality, sustainably-sourced Kindling, sold netted. Fully seasoned, and where necessary, kiln dried on site by our biomass-powered kiln, down to a moisture content of below 15%. Kindling (packed a bit neater) – this kindling is also sold in Unicorn Grocery, Chorlton. ECO Kindling (a bit rougher around the edges), but a bigger bag! Both made from our locally & sustainably sourced, softwood & hardwood timber – a great way to use treework arisings, and excellent for getting your fires started faster! Free delivery within the M60 Ring Road with a qualifying delivery of firewood. More details below. Easy way to get a fire started! 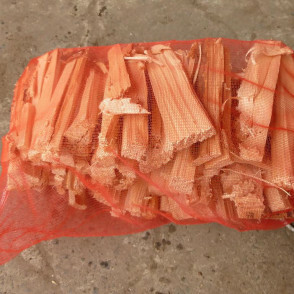 Kindling (small bag): Our Kindling comes from the high quality timber off-cuts we get from the arisings produced from our Arboricultural services. The pieces are generally well shaped and neatly packaged. It is sold by the bag, as opposed to weight, because this is highly variable but an average bag is usually ~3kg. This kindling is also currently sold in Unicorn Grocery, Chorlton. ECO Kindling (large bag): Our ECO Kindling comes from a variety of the off-cuts we get from the arisings produced from our Arboricultural services. These pieces are still all made from high quality softwoods and hardwoods but are a bit rougher round the edges and, as a result, can be a little bulkily packaged. It is sold by the bag, as opposed to weight, as this is highly variable but an average bag is usually ~6kg. NOTE: We can only deliver this product to addresses in the Manchester area, with a qualifying order of firewood (min 1m3). Any orders placed outside of the Greater Manchester area will have to arrange to collect their items. Details of delivery prices and arrangements.